Some new UMDs are detecting files in the ms0:/seplugins and ms0:/iso folders and causing problems, even deleting files from these folders. This plugin will hide these folders in GAME mode so they can’t be accessed. 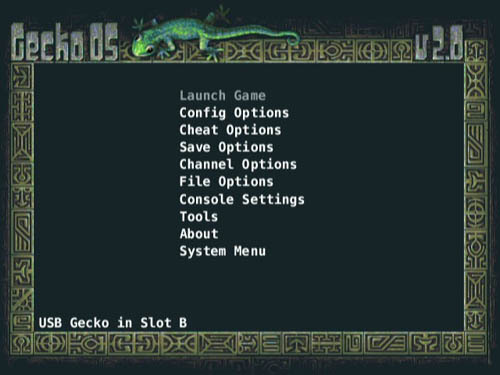 Sorry for the delay in Gecko 2.0 software, i know was supposed to be released on the 1st but i decided not to rush it, fix all the bugs and figure out the best way to complete the cheat options so users no longer have to use single text files. anyway here a screen grab i took, so you can see whats coming, some new features and tools, and big improvements on old ones. File menu is still not finished, which is basically, DOL, ELF, MP3 loader, which is alot like SD load but supports more file types. WiiGator, the author of an open source Wii backup loader, has been working on a GameCube loader as well. One of his beta testers has uploaded a video showing a beta build of the loader. Compatibility is looking pretty good, though the disc speed is limited to 3x, as it is for Wii backups. Watch the Preview on YouTube. The last days I was working on a loader for GC backups. This is only a preview. The release will be within the next week. A tester made a video showing it in action. Sorry for the bad quality. I tested it with the games I have. All games seem to be fully working. There may be games which are not working. IOS249 with backup support need to be installed (e.g. my cIOS r7 from backuplauncher 0.3 gamma). There are sometimes problems with the DVD read speed. So there is sometimes a very short delay in a few games. The game play is only barely influenced. This was only the case for one of my games. If you eject the disc, no disc can be detected after it. For 2 disc games use the second disc to boot, if you need to change the disc. You will need to copy MIOS files to a SD card if you don’t have a internet connection (either Version 5 or Version 6, both is working). There are problems with the Nintendo servers in the last time. You may not be able to download it.